Gundam games tend to get a pretty bad reputation outside of Japan, though this is admittedly due to surreal and awful choices on the part of Western publishers really. The fact of the matter is that Gundam has quite a long and proud tradition in Japan of producing quality entries to the mecha gaming pantheon. So much so that collaborations with companies like Capcom have birthed wildly popular arcade offspring as well as further console based ports. Considering Capcom’s solid arcade versus history, it should come as no surprise that they have been making very solid Gundam themed arcade versus games for nigh-on ten years. Normally specialising on one series and/or timeframe of the Gundam mythos, Capcom kept their approach very focused. It wasn’t until quite recently when they literally threw pretty much every Gundam into the ring within one game. Naturally, the subsequent versus depth that followed on from such a decision has pushed these games up a notch in terms of their functional prowess. Despite the original games being rather well wrought, they were still derivative of games like Virtual On. Whilst they retained ranged and melee attacks there was only one mode of combat for both; that of fixed circle strafing dashes. Compared to Virtual On, where you had to manually plan fixed vectored dashes across an arena and then only via a tethered camera, Capcom distilled the games down so that the visual tethering also became functional. A lot of this was down to the rules laid out in the host work and Capcom also had to make sure the games appealed to frustrated Japanese salarymen, that just want to pummel a few Zakus into submission. It was all very simple but it worked and the games garnered an arcade versus fanbase. Over time and multiple iterations later this fanbase has outnumbered the casual salarymen and the games have become more involved as a consequence. The big addition that kicked off a few years back was with Capcom’s Gundam Seed arcade games. For one they dropped the ineffective space based missions but also introduced an all new boosting function. Although the games retained their circle strafing core, the fixed duration boost made a huge difference to the pace and tactics employed in the games. As you could literally break out from the tedium of circle strafing and do so at tactically opportune moments. The shift that changed the games even more dramatically, was how they opened up in regards to the unit variance. As the older games were often series/timeframe specific and this ultimately limited the functional scope. 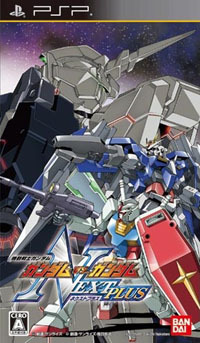 In March 2008 Capcom released Gundam vs Gundam and as the title suggested the game essentially featured almost every Gundam from every series, OVA and movie in one game. The corollary of this was that the unit variety was pretty epic. However, one of the main flaws in Gundam vs Gundam was that player’s could summon map wide attacks, called G-Crossovers. Whilst visual crowd pleasers they were pretty brutal in potency and the fanbase voiced their concern on how it lowered the standard of versus play. Following on from this there was an even bigger game and the most recent; Gundam vs Gundam Next. Not only did it feature more mobile suits but Capcom also shrewdly removed the excessive map wide attacks. The notable improvement was also how Capcom implemented a new type of boost dash. This was called the Next Dash and it allowed the player to cancel out of anything with a boost dash, but only if they had boost left in their gauge. This was quite a subtle improvement but profound in terms of its versus ramifications. Unsurprisingly this new feature was met with with widespread praise from the versus fanbase. Considering the recent games are based upon Namco’s System 256 arcade board, which is essentially a PlayStation 2 in a box, porting that to the PSP shouldn’t be an issue. For the previous, Gundam vs Gundam the port was pretty serviceable but it did suffer a few framerate issues. Since then, Capcom haven’t been idle as the latest port is remarkably well implemented. Unlike Next, the arcade iteration it’s based upon, Next Plus has received quite a large number of improvements and modifications. Notably is a mission mode as well as several PSP exclusive mobile suits. In addition, previous units from Next have also been re-balanced for this port – all for the better as some where a little uber in the arcade. As per the arcade, Next Plus offers each of the “routes” through the game and these can also be played in multiplayer. There are several new routes for the port as well and these are unlocked through play, as are the new mobile suits. The slightly odd thing is that the arcade element in Next Plus is actually quite lengthy. For a hand-held port you can’t really jump in and out as you want, as you have to finish the whole route to get the unlocks. Compared to the mission mode, where you can literally play a mission at a time, the arcade element can be a bit longwinded if you just want quick versus bouts. That said none of the game is ever tedious or dull, as the sheer speed of combat now is suitably intense. Couple that with the Next Dashes, allowing you to cancel out of fluffed up moves, and everything just flows a lot more smoothly. You then have the vast array of mobile suits to choose from, each with their own control setups and nuances. There are also a fair amount of functional hat-tips to the Gundam mythos with each unit too. As something like the Reborns Gundam uses Tau drives and as such initiating Trans-Am is a one shot deal or the Bio-Sensor in the Zeta Gundam triggering each time your wingman dies. They’re nice touches and not shallow either, as they all have a purpose in the game. However, for all these wondrous elements and the overall solid nature of the port there are certain shortcomings down to the hardware it’s hosted upon. This is not to say the framerate issues have re-surfaced, because they haven’t, but that the point of these games and what they are balanced around isn’t a solitary gaming experience. They’re squarely meant for human multiplayer, as such the lack of Infrastructure (Online) support in this port is unfortunate, though it does support AdHoc (local Wi-Fi) which is at least something. Separately, the controls can be a little awkward on the PSP and the game would benefit from being played on a decent stick now, as it is in the arcade. In short, whilst this is a thoroughly excellent PSP game, it would make more sense if Capcom had ported this to the PlayStation 3 or Xbox 360. The game needs pretty beefy online support and a stick, plus having the graphical upgrade wouldn’t do any harm either. That said, this is still a mightily good port of an already quality arcade versus game. Even if you’re completely ignorant about Gundam, the amount of versus depth present should keep even the most cynical gamer occupied. This game is wasted on psp, Im sorry, it would be like trying to play king of fighters on the psp or something, you need a joystick, I still play the seed ones on my ps2 now and again with a joystick and I dunno how anyone can seriously play it without one. Also this is a Vs game, the reason I stopped playing my ps2 ones was lack of human opponent, would it be that hard to release these threw PSN and Live? Its a pity, I find myself not caring about the Gundam vs series anymore since they moved it to psp, as much as I like it, its missing two huge components. I think it’s a very playable PSP port and accurately executed too. However, I agree that it would have worked better on a console with a decent online multiplayer setup. That said, as a PSP game, it’s really quite bloody amazing! These were developed by Capcom and published by Bandai Namco. Byking was formed from this team and made the EXVS games.